So, going in you can’t help but see the mention of Twilight as a comparable to Molly McAdams new title. Nothing will ever turn me off faster than that reference, but the rest of the synopsis (and the buzz) was enough to capture my interest. Do you remember in Gilmore Girls when Jess appeared, and the lure of that bad boy had Rory utterly confused? Sure, there was Dean – reliable, handsome, adoring Dean, admittedly NOT the sharpest tool in the shed. Then Jess appeared: brooding, surprisingly quick and sharp, desperate for love but too cool for school. It’s similar here… at least in set up. Aurora (Rorie) is a college student with an irresistible draw to the hot boy, Jentry, the one who is up front about his just one night rules, and his seeming disinterest in more. She’s not that girl — but for a night – why not. And a week later, she meets THE guy for her – the sane, honest, open and reliable Declan… the one who will stick around in the morning. But she’s torn. And we have a triangle – not a bad thing, except the shame with which Rorie applies to her time with Jentry – the time she can’t stop thinking about. Let me start by saying the McAdams builds a wonderful character – and each one of these held back – even with the overuse of time switches, from past, near past, even nearer past to present (confused yet – yes – it was a huge distraction). With all of the back and forth, alternating narrations the story’s impact and pieces don’t fall into place as you read – sections and moments become relevant and important several pages later. It was jarring and often distracting to have the story doled out in pieces that didn’t appear to logically correlate, but come the last pages…. I got it. I saw why Rorie was confused, and actually BOTH Declan and Jentry had viable standing to be ‘her’ choice. Her desperation to do the right thing often discounted the major question – right for WHOM…and as is common with someone of this age, and in this genre, those choices are flexible, fluid, heartwrenching and often carry suitcases of regrets. A wholly unique construct of a story that could have been boy A or boy B…….and still been impossible to not remember. 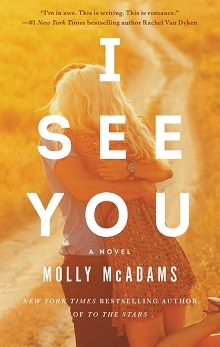 Molly Mc Adams grew up in California but now lives in the oh-so-amazing state of Texas with her husband, daughter, and fur babies. When she's not diving into the world of her characters, some of her hobbies include hiking, snowboarding, traveling, and long walks on the beach … which roughly translates to being a homebody with her hubby and dishing out movie quotes. She has a weakness for crude-humored movies and fried pickles, and loves curling up in a fluffy comforter during a thunderstorm ... or under one in a bathtub if there are tornadoes. That way she can pretend they aren't really happening.